Night sky watcher Robb Rosenfeld took this photograph of a Perseid meteor with Venus, Jupiter, and the moon. 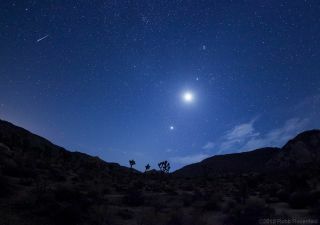 He took the photos on August 12, 2012, in Joshua Tree National Park, located in southern California east of Los Angeles. The brightest planet in the sky, Venus is the closest to Earth. Its shining presence as it hovered near the sun earned it the nickname of both the morning and the evening star, depending on its location within its orbit. Let's take a look at just how far the distance to Venus is. Venus is the closest planet to Earth (it's also the most similar in size). But its proximity to our planet depends on the orbits of both. The two planets travel in ellipses around the sun, and so the distance between them is constantly shifting. At its farthest, Venus lies 162 million miles (261 million kilometers) away, according to NASA. Venus isn't the brightest planet in the sky because it is the closest to the sun; Mercury bears that honor. But unlike Mercury, Venus has a thick, cloudy atmosphere that reflects the light better than Mercury's rocky surface (it also keeps the planet piping hot). This causes it to stand out, brighter than any star even at its dimmest. Combining information about Venus' 1639 transit with the principle of parallax allowed for the most accurate estimates of the distance from the Earth to the sun at the time. In 1962, NASA's Mariner 2 became the first spacecraft to send back information from another planet. Launched on August 27, 1962, it performed a flyby of the planet on Dec. 14, having taken less than four months to reach Venus. The most recent terrestrial visitor to Venus was NASA's Magellan spacecraft, which took up orbit around the shining planet. Launched on May 4, 1989, it began its orbital insertion movement on Aug. 7, 1990, having taken a more roundabout trip after scheduling issues following the Challenger disaster. Magellan mapped the surface of Venus in depth.